The Haida: Eagle or Raven? 2 Have you ever wondered what animal's crest your family would choose if you were to choose one? Some native people lived so close to nature that animals took on great importance in everyday life. This was especially true for the Haida. 3 The Haida are a native people who lived just off the coast of British Columbia in the Queen Charlotte Islands. 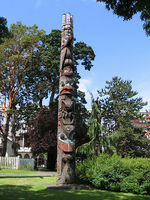 They are well known for their wood carving, especially totem poles. 4 Animals were very important in Haida stories and in their family crests. All animal crests were under one of two groups, the eagle or the raven. A few animal crests were shared by both, but most were separate. No one could marry someone with the same family crest. 5 Those family crests were carved into the totem poles and sometimes the prows of their canoes, especially head canoes. They were special canoes for a village chief. The Haida also made large war canoes and canoes for carrying cargo. They were well made boats and sought after by other tribes. 6 Making a war canoe was a long process. After the tree was chosen and dropped, a carver would wait until fall to begin shaping it. That was when he had more time. Once the first snows fell, the log could be skidded down to the water and towed home. 7 By spring the new canoe would be finished and its hull painted. It and other canoes would be taken to trade for goods the Haida needed or wanted, like copper and robes woven from cedar bark. 8 Their superior canoes guaranteed the Haida the edge on the water. Each war canoe could hold up to sixty paddlers. Most tribes preferred not to fight the Haida on the water, because they rarely lost. They were also fearsome on land. Sometimes the women would get involved in a war and fight alongside their husbands. 9 Wars were one of the ways a Haida warrior would gain wealth. Sometimes prisoners were taken as slaves to be sold to other villages. Other times they looked for copper or other precious items. Feedback on The Haida: Eagle or Raven?